These last couple of days have been pure, complete craziness and filled with overwhelming moments of adrenaline rush… Being in L.A is a real dream come true, I feel like I’m levitating in a little colorful bubble of heaven. It might be the reason why I didn’t post for a couple of days, I felt the urge to live the moment and come back even more inspired with so much to say and so much to share with you guys. As you might know, 2015 is full of new resolutions for me and the whole Kayteam… We all had a special feeling on New Year, as if we knew that something crazy was going to happen. I’ve never felt as motivated, excited and passionate. It’s like a breath of new energy came in me as soon as the 1st of January hit our calendars. Spending time with Lance, my producer buddy, doing music all day, everyday is beyond words… It’s all I ever really wanted and honestly, there’s no other place I’d rather be. My past couple of days have been like this : waking up at around 7am, kicking off with dance/work-out classes, then vocal classes, then studio/songwriting/practicing with Lance all day with music related meetings + events in the evening. So between seeing Taylor Swift at my dance class this Thursday, enjoying a sassy glimpse of Jamie Dornan a.k.a Mr. Grey at the W Magazine, Pre-Golden Globes party and being acclaimed by 10 paparazzi on my way to get coffee, days have been a little wild… Like really wild. I’ve been living every single second to the fullest, that’s why I disconnected a tiny bit from the online world. And you know what, it feels so good. It gives me even more things to say when I get back at it. Living in the present and experiencing “real life” instead of seing the world through the lens of a camera felt quite refreshing to be true. I felt more inspired to write songs, to have in depth conversations, to start a new diary! I also got addicted to Twitter (make sure to follow me @kayture) where I share some ridiculously exciting introspective inner monologues…! We’ve also had such an awesome Q&A party! I was so impressed to see the hundreds of questions that have been sent out, we’ll definitely do that more often you guys. I am thrilled to share this new editorial with you. We shot it on the rooftop of the Galeries Lafayette, in their private shopping suite where I had the chance to pick and choose some gorgeous party outfits… Black has always been my color of predilection, for probably everything. As soon as I saw this black leather dress from Lanvin, my heart literally melted. It felt like Matrix met Audrey Hepburn and they had a baby together. Boom. It’s such an edgy yet incredibly beautiful piece. I wanted to mix it up with silver details such as these Gucci heels, Messika diamonds and a little Lady Dior bag. Outstanding!!! No extra words needed!! Wow perfection from top to bottom. That dress is to die for! I'm glad your living your dream in LA!! A stunning occasion!!! Great shoots! I wish you the best of luck in your music career! The pictures are so elegant and classic, just perfect! That dress is gorgeous and the jewelry pieces are all so beautiful! Wow these photos are stunning ! You look gorgeous, love your dress ! Oh my god the dress ! It is so stunning and it fits you perfectly, like it seems like you were born in it. I totally adore the look, with the silver details (specially the ring and the heels). Beautiful dress and omg that LD is perfection! Awesome dress, like a princess from a ball .. and so beautiful photos, that I am stunned now..
You look SO amazing!! This location is just incredible. 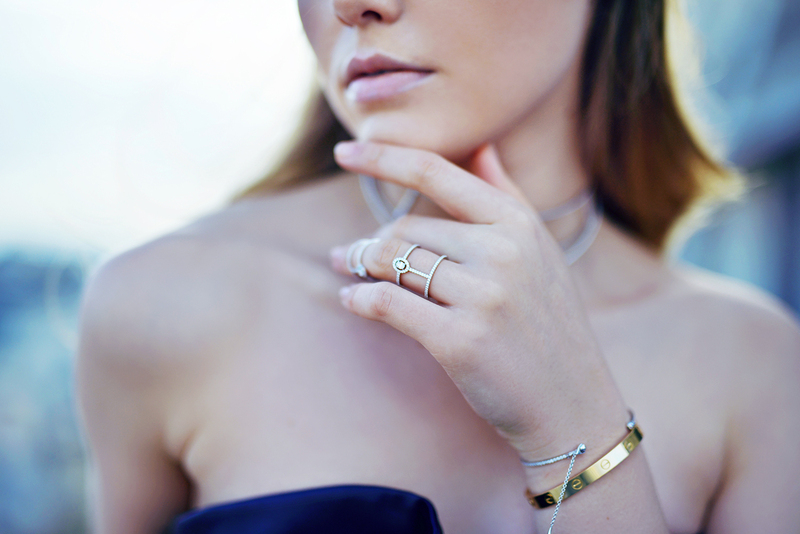 I love the jewellery you have on here, so beautiful! Everything about these pictures is absolutely amazing. Good work! Such elegant photos, amazingly done! The dress is totally awesome and I really like the location aswell! Stunning jewelry! I love the necklace and the earring! That's such a beautiful dress, like everything here! Girl, your hair and makeup is ON. POINT!! Dying over the jewelry. Your dress show-stopping! Love the add-ons as well! I really so happy for you that all your dreams are coming true! That's really inspiring for me to go on! Thank you for that and for sharing all your adventures! This dress is indeed insane! The combination of the classic cut with this unexpected material is great. And love the little Miss Dior with it. You look gorgeous! The dress is so beautiful and the bag is amazing! Enjoy every moment of your life! Love the jewellery you're wearing. beautiful editorial you look stunning and I love the dress! This Miss Dior purse is precious! Stunning dress and fabulous heels! Lovely jewelry too! Awesome setting! I'm starting to wonder if very successful bloggers, like you Kristina, don't start to lose focus on the purpose of their blogs.With the time, the emphasis of your content starts to fall more on your campaigns, editorials and collaborations with brands. I think readers are rather more interested in being inspired by your amazing everyday street style sense. In the end, we could see all the pretty pictures in the magazines as well and I think that shouldn't be the purpose of blogs. Your blog became more of a business model diary/portfolio, and I feel like it's not aimed at me as reader, but rather at potential clients, who'd like to hire you for a job. In the end, of course you are free to post whatever content you are comfortable with on your own personal blog, but I really really wish you take my words into consideration. Unbelievable !! You look OH MY GOD ! No wonder paparazzis get crazy, you are a star ! Love those pictures, they are so chic and glamorous, and on the top of the Galeries, no less ! Beautiful dress! You are amazing! Whoops copied the wrong thing at the end! You look SO stunning! Such a glamourous and gorgeous look! 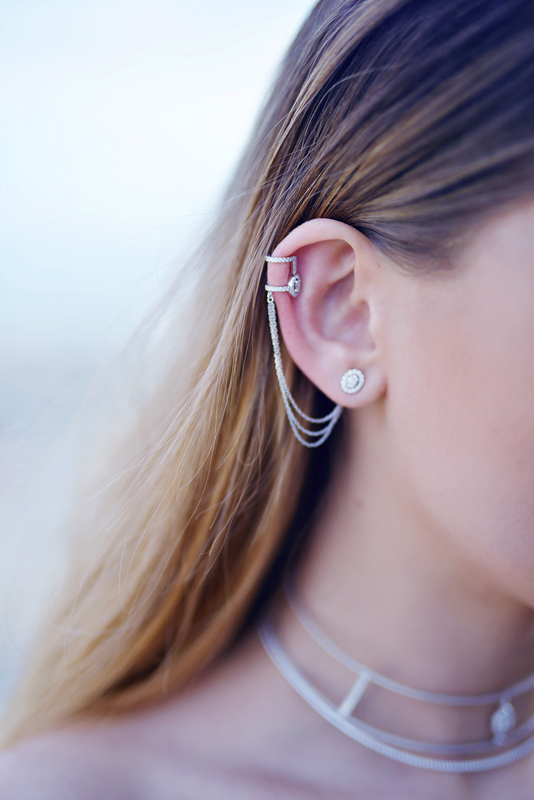 Love the cool accessorizing, especially the statement ear cuff! Beautiful and classy leather dress too! No words for this pics...maybe just WOW! This dress is absolutely lovely! Emma Stone wore a similar dress to this and I loved it on her just as much as I love it here! And your styling is wonderful! Wooow, beautiful post and blog! I've been seeing all your updates on Instagram and I have to say, pretty crazy life you're leading! You're really entering the entertainment industry with the right foot and I'm pretty sure you know exactly what you're doing - good luck with this thrilling adventure! I'm sure you'll nail it. I really like how expressive you are in these posts; you inspire me to read more, learn more, write more, and more importantly, think much more. You're not just writing music for the sake of it, but you want to translate whatever's inside you through the words. I'm sure once your album/music hits stores it'll be absolutely huge. I also found out you'll be writing your book in French - I hope it'll be in English as well! I'd love love love to be able to read it. Other than that, love this outfit. You really know how to capture a dramatic mood with the outfits you put together. the Lanvin dress is quite the masterpiece and you pulled it off so well with the Dior bag and Gucci heels - definitely feels like an eloquent editorial. Your dress is perfect. I love your jewelry! And your shoes are amazing! Well, the dress is seriously stunning! Beautiful dress and i love that makeup! These images are so wonderful - they look like they've come straight out of a fashion magazine! The dress is so, so gorgeous too, you look beautiful! tu es majestueuse kristina ,magnifique !!! belle!! !je suis ému par ta beauté !! !et aussi par la sincérité de ce que tu écris,excitée,vraie,naturelle !!! je t'embrasse petite fée !!! à bientôt!!! nice!!! I love your jewels! Amazing dress, You look great. Love these shots. So beautiful! Oh, I love this Lanvin on you. It's fun to see you get a bit edgy - while still giving it your classic and demure touch. Enjoy your time in LA! You look so wonderful! This dress is insanely chic! You continue to amaze me Kristina with each blog post. Well done. Black suits you. I LOVE those shoes omg ! Amazing pictures! The dress and the jewels are so elegant! The make-up is great too! So glad you are taking time to enjoy everyday - it's a goal of mine as well this year to be more present each day. It's always nice to read your posts & doesn't matter if it's been a few days. Hi Kristina!! I've been following you since last year!! And I really love your style!! Besides, you're such a sweet heart!! I'm a huge fan of you from México! And it was a pleasure to see a special article about Tulum which is a magic place here!! I hope one day I can have so great sence of style just like you!! Hahaha I love this post, I mean when I was reading all about what you have been passing it was pretty awesome, seeing Taylor Swift, the party of the Golden Globes, and the paparazzis meanwhile you was just going for a coffee looks really unrealistic for me. Kristina I hope you have success in this new adventure you're having now of writting and singing! Stunning, love that Dior bag. The photos are amazing! You look gorgeous! I am so happy for you that L.A is like a dream come true ! Enjoy it ! Tu as raison, prends le temps de profiter de la "vraie" vie et de passer du temps avec ceux qui te sont proches à Los Angeles. C'est vrai, le monde virtuel et interactif est très important pour toi, pour ta carrière, mais il n'y a rien de plus important que profiter et vivre pleinement. Et je pense qu'il n'y a rien de mieux q'un environnement ensoleillé pour se ressourcer ! Pour ce qui est des photos... Il n'y a pas à dire, pour moi Paris est photogénique. Qu'elles belles photos avec ses toits en arrière plan. Un décors parfait pour un photoshoot ! I love your dress, honored that you shooted it in Paris! I am so in love with the shoes. Alwas like to read your thoughts, you sometimes speak out of my heart. Fabulous look! Thanks for sharing this inspiring post! Dear Kristina, today I experienced the biggest disappointment ever. The blogger I love, the girl whose lead I follow photoshopped her legs on Instagram. Why would you do that to us? To yourself? Everybody loves you the way you are, do not get all psyched about skinny figure in such a young age. You look skinny all the time, why do the obvious photoshopping? It looks so clumsy, everybody can see the difference. Sad day for all of us and I hope you will publish some statement regarding this matter. Kristina you have such an amazing style and life and you are such an amazing inspiration to everyone you meet! I''ve loved following you on your journey, where ever KAY goes. I love you so much! I loooooove dresses, and this one is one of the best I've seen so far. So beautiful! I'm gonna say this with the most amount of love possible: I wanted to see a shot of the dress/whole look and you kept putting that purse in the middle girl! It would have been amazing if (even though I know that you probably had to show the bag and all that) we could have seen and entire picture without you putting in our faces the bag, the jewelry, etc. The amazing dress lost protagonism. I think the background was cool, the styling was on point, but I was missing that shot. I mean, there are probably 9 of 10 pictures with the bag in the middle. I loved the vibe of this shoot, it was just that detail. Wooow amizing editorial, the bag is so stunning and the jewerly too <3! it's always good disconnected for some days from the online world...these last holidays my phone broke up in the first day and it was good to remember those days with no internet connection... just live life!!! so good! btw, you're gorgeous in that dress! great pics! Wow! You look absolutely stunning Kristina! You're sooo inspirational!Your photos are always so beautiful!I wanna live in L.A.Such a beautiful place! Love every details, every expression and the dress !!!!!!!! These pics are absolutely awesome! How beautiful and striking the photos are! This sounds like such an exciting time in your life. There is absolutely nothing wrong with taking time to step back and soak it all in. I hope we can hear some music from you soon! I wish you all the best in your upcoming and future endeavors. The pics are breathtaking and the jewelry is amazing, I love love love the earrings! Eine wunderschöne Frau in einem wunderschönen Kleid. enjoy the rest of your stay in LA. Wow I love this outfit. This dress has a stunning cut and color!! Photos on your blog are just outstanding! You and James make a great team. Keep up the good work, hon! Super stunning and chic look! That Dior bag is just perfect! All the jewelry is beyond amazing!! Absolutely stunning editorial! Wow! A few weeks in LA and you meet T.Swift in a dance class? Lucky! I've been in LA for years and haven't bumped into any celebrities! Haha. So elegant and beautiful. Love this gown on you. Absolutely gorgeous! And the photos are so beautiful. Wow that's absolutely stunning Kristina <3. I know what you mean "to take off of the online world" and spend some days to see the real and beautiful world. It is so much more. And this is absolutely inspiring. I'm really super excited, how your songs gonna sound like. Oh my gosh all of your jewelry is so gorgeous! wow this is amazing! that dress! Perfection! You look stunning! I love every detail about the look! Great job! Check out my latest outfit post. There are no words for the beauty of this dress and your amazing shoes! Stunning pictures! <3 I looooove that dress! Sublime dans cette robe de princesse ! i love how you can make every look work, you can be sweet and romantic, edgy, bohemian, fierce, you name it. beautiful! Hip but sophisticated! Love it. You are perfect and my inspiration. Your style, YOU'RE - Your looks! Love it everything!!! Love you!